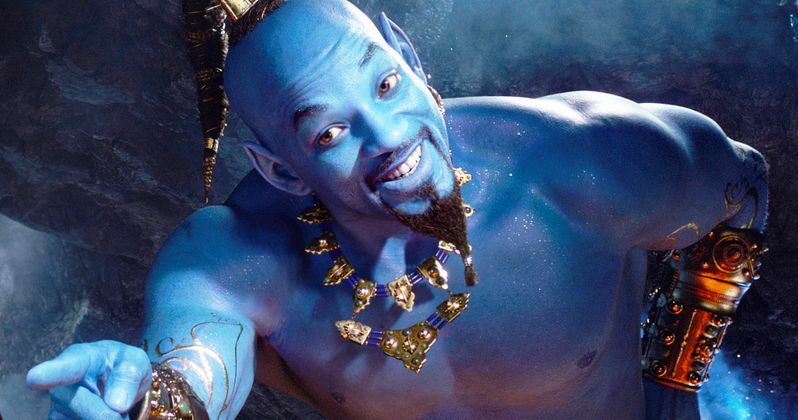 Disney has released a new look at their live-action remake of Aladdin and Will Smith is blue. This follows the first teaser that was released in October and a bunch of first-look images that were released in December of last year. We've seen Will Smith's Genie, Abu the Monkey, the villainous Jafar, Aladdin, and Princess Jasmine, but this is our best look at the adaptation by far. There were hints that Disney was going to drop the new footage during the Super Bowl when they released two new banners for Aladdin and The Lion King a few weeks back, but the studio decided to hold off. While The Lion King has been called out for not being "truly" live-action, the same cannot be said for Aladdin. With that being said, there was a lot of heavy lifting done in the post-production process to get the movie to look as magical as it does, especially considering that production wrapped back in January of last year. It was announced in 2016 that Guy Ritchie was on board to direct from a script written by John August, and since then, Disney fans have been wondering how everything would look. Thankfully, the wait is over, and everything looks great. Aladdin is a live-action movie with a lot of digital embellishments to bring some of the more magical aspects of the original movie to life on the big screen. Guy Ritchie and crew have done a pretty amazing job as evidenced by the latest footage that Disney has released for us during the big game. In reality, Disney doesn't even need to take part in promoting their projects during big events like the Super Bowl, but it sure is welcome when they do. The Lion King live-action remake has hit some snags over the past few months after the teaser was revealed to be a nearly shot-for-shot remake from an iconic scene in the original movie made in CGI. As it turns out, the only words uttered in the Aladdin teaser released back in October were from the original movie. This wouldn't be that big of a deal, but the writers responsible for those scenes and dialogue are not getting a cut of the new live-action remakes by Disney. It looks like it might be pretty hard to get credit on the new adaptations. The live-action Aladdin adaptation is expected to follow much of the same story from the 1992 classic, much like the rest of the live-action projects that Disney has coming up. 2019 alone sees the release of Dumbo, Aladdin, and The Lion King, which is pretty huge. Tim Burton's take on Dumbo is the first one out of the gate and it will more than likely set the tone for the rest of the live-action remakes on the way. However, Aladdin and The Lion King are two of the biggest jewels in the Disney catalog released, so they have the potential to be pretty huge. You can check out the latest TV spot for Aladdin below, thanks to Disney.